St. Rita of Cascia High School has a long history with the PADS Shelter on 71st and Kedzie in the city's Chicago Lawn neighborhood. 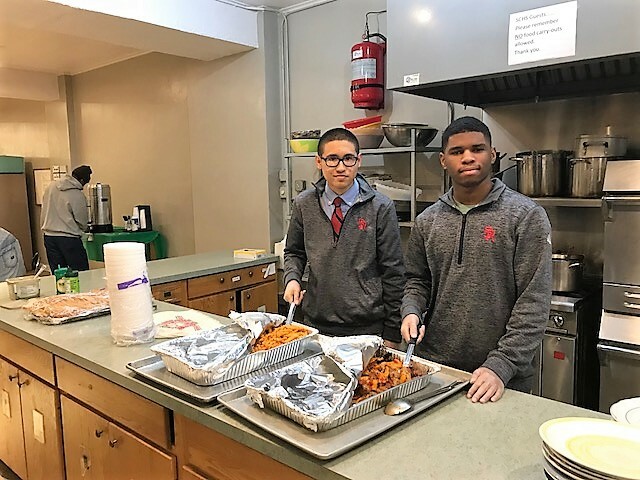 For many years, groups of St. Rita students have volunteered on a monthly basis to serve food to the local homeless at the shelter. Led by Director of Student Life Mr. Josh Blaszak and R.O.S.E. hour director Mr. Andy McIntosh, students have spent countless hours at the shelter providing good will and service to those less fortunate people in the local community. On January 30th and February 7th, the St. Rita Cooking Club joined in on the good will as they prepared meals for guests at the shelter. The Cooking Club led by Discipline Office Administrative Assistant Mrs. Mary Barnes, has been in existence for over 3 years. They meet on a monthly basis to cook meals and teach St. Rita students the finer details of preparing a meal. In all, nine members of the Cooking Club took part as they prepared a meal of baked mostaccioli for the guests.